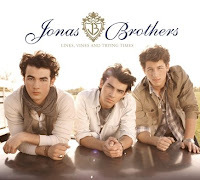 The only really interesting album release this past week was the JoBros new record (and no, I haven't listened to it yet, but I've heard good things about it...keeping my fingers crossed). Rolling Stone has given the record a 3/5 rating...which leaves me holding my breath to see how this new "adult contemporary" slant to their power pop will do for them...How sweet of them to drop their fourth album the day before my birthday, though! Really, boys, you shouldn't have. I'm blushing...During midweek countings, they are looking at a 300K first week, and definitely take #1 next week. Is anyone surprised? That answer is no. As for this week, the Black Eyed Peas' "The E.N.D." swept #1 out from under Dave Matthews Band, raking in more than projected with an estimated almost 310K in its first week. Boom Boom POW! Their little engine that could single, "Boom Boom Pow", retains the #1 position on the Hot 100 for an 11th week this week as well. My guys in Hollywood Undead are listed as #1 on the Viberaters list at Hits Daily Double due to their rapidfire increase in spins of their brilliant and socially concious new single "Young" at rock radio. Others on the list include Kristinia DeBarge at #6, Jessie James at #9, David Guetta at #13 and LeToya at #14. Shinedown's crossover hit "Second Chance" is officially the most played song on Hot AC radio (and #4 on Top 40). That's a sentence I never thought I'd write. Their followup single, "Sound of Madness", is #1 at Active Rock. In more Top 40 radio news, Lady Gaga continues to have two songs in the top 10 ("Lovegame" at #7, "Poker Face" at #9), while Katy Perry finally makes herself known with "Waking Up In Vegas" hitting #10 (and I'm sick of it already). Somehow, the catchy yet crappy 3OH!3's "Don't Trust Me" lands them at #3 and is in dangerous throwing distance of "Boom Boom Pow" (#1) and Beyonce's "Halo" (#2). Wow...is the apocalypse coming or something? Island Def Jam's new chicks (to hold your interest while Rihanna records her next album) Kristinia DeBarge and Jessie James with "Goodbye" at #12 and "Wanted" at #31, respectively. Keri Hilson's mediocre single "Knock You Down" is doing wonders on the Hot 100, and is growing legs at a rapid rate at Top 40 radio, landing at #23. It's also #1 on the Urban format and #2 on the Rhythmic format. The Ting Tings climb to #24 at Top 40 with "That's Not MyName", and FINALLY(!) Jordin Sparks cracks the Top 30 with "Battlefield" landing at #25 and cracking the 1000 spins a week mark. BEP's new David Guetta single "I Gotta Feeling" lands them at #27 and is gaining at a rate of almost 100%, while Guetta's single with Kelly Rowland stays put at #43 (but is gaining...slowly). Kings of Leon break the Top 50 with the brillo "Use Somebody" (a former Rock #1) at #48, and doubling in spins in one week. And, unfortunately, another week and still no sign of V Factory. STILL no v factory? Sigh. Is it only us who wants to live in a world where the top three is those guys, CCC and Simon Curtis? HAPPY BIRTHDAYYYYYYYYYYY! Wait, is it your birthday now? Well you get the point. Nikki - Haha judging on our time difference I think it still was when you wrote your comment but thankfully, it isn't any longer. haha. First off, Happy Birthday! I kept saving this entry to come back to, so it's about time! The Little Boots EP is quite good for what it is. And it just doesn't look like it's going to happen for V Factory, does it?